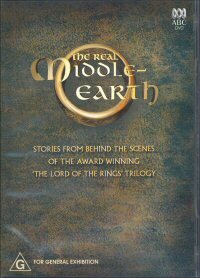 The Real Middle Earth is the delightful DVD about the effects that Peter Jackson's blockbuster has had upon the country of New Zealand, in particular the areas where the filming actually took place. Whilst set up to reflect the spirit and feel of Middle Earth, the feature is actually a delightful postcard of NZ in a very similar style to what you might expect to see from the Getaway television show. We are taken all over the place to where the Hobbit dwellings were constructed and now exist as tourist attractions. As much a look at New Zealand as it is a true look at the Middle Earth Trilogy, presenter Jim Hickey does get us in for a chat with Peter Jackson and a number of the people who worked behind the scenes and even those who were however briefly in front of the camera. It is all presented in a very easy going style that is enjoyable to watch and for true fans of the series, you will be more than pleased to note that they even visit the jeweller who was the creator of the Ring. The sheer logistics involved in making these films would have been staggering to say the least, and the people who are behind the scenes got into it so whole heartedly that it is actually something to behold. Everything looks and sounds fine with this disc. It looks and sounds as though it was made for TV and quite possibly it was considering it was produced in part by Televsion New Zealand. There are no extras on this DVD. My only gripe with this DVD is that the running time is a very very short 43 minutes, however that way it's giving you a great little insight into a very nice part of the world and how it reacted to the Lord of the Rings phenomenon. To top it off, it did exactly what the aim of producing it was: it actually did make me want to visit New Zealand and check out all these great places.